Fresca’s Penny Cooper adventure made me think of my repurposed Ovaltine advertisement, and that made me think of a Nancy panel that I saved some time ago. I love the weirdly grown-up threat “We’re through.” “We’re through, finished, washed up — if you don’t stop dunking!” Though the inside of each cup is white, I think that Nancy and Sluggo must be drinking and dunking in coffee. Who dunks in milk? Not kids who use cups with saucers. Which raises all kinds of questions: Are Nancy and Sluggo in a café? Would a café serve coffee and donuts to kids? Is the Ritz household the setting for this strip? Did Aunt Fritzi brew the coffee? Does she know that her niece is drinking it? Is Nancy using the good china? Does Aunt Fritzi dunk? 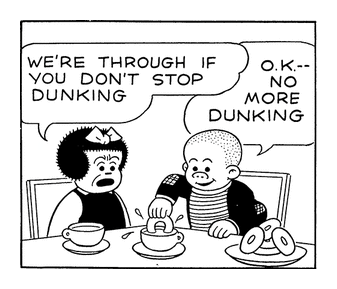 Does Sluggo’s dunking remind Nancy of her aunt? I’ve revised this panel in the interest of coffee. Guilty. Sometimes in coffee cups. Sometimes on saucers. When my son came back from college, he would drink all my coffee, which I complained about. He said, come on, Dad, I can't resist it, I've been drinking it my whole life. For a couple days, I was flattered, oh he's been drinking my coffee his whole life and loves it. Then I realized, wait, he's 18, he's been drinking it a year at the most. Yes, “I’ve always loved [blank]” is pretty doubtful. I think it’s a big deal when your children start to enjoy coffee or tea. My only childhood memory of coffee: a sip from my grandparents’ thermos whenever everyone went to Coney Island. They brought coffee to the beach. Also ham sandwiches.